Loving the program by the way! I use it along with a dumbbell we have at home (built by a local ringing friend) and it is fantastic for method learning. I have studied the Help text and I must compliment you on the best set of documentation I have ever seen, for any software, on any platform. It is well written and extensive and sets a new standard of excellence. We used VB for the whole of this evening's practice (6 and 8 bells) without the slightest hiccup. Very many thanks for your help. The graphics we discussed are now superb, and take VB from third place by some margin to a clear winner. Well done. All that's needed now is they grunt and sweat according to the weight of their bell. VB would certainly be my recommendation now for any simulator workstation. Upgrade to V3.4 successfully installed, along with the ringers file. Runs fine under Windows 10 on my iMac under Bootcamp. Good job! You win the Oscar for Most Impressive Animations in a Simulator Software Package, hands down. Now we have a good understanding of VB it is operating beyond what I had originally imagined and our ringers are really benefitting. I have received my disk and installed the software. Thank you - it is a tremendous job you have done. I have been an IT professional all my life and have seen all sorts of good and bad software, but yours is very good/excellent on first impressions. A very impressive piece of software and we especially like the moving number bar as this will be a great aid in showing how bells move inside a method with only pairs of bells changing at any time. Virtual Belfry has arrived safely and I am delighted with the programme. What you have achieved with the animation is spectacular! We've just taken part in our annual "Church Discovery Day", for which the ringers had a stall inside the church (as well as "guided tours", demos and "have-a-go" in the ringing chamber). I thought Virtual Belfry, running on my laptop, would be a good thing to display on the stall. It was even better than I had expected. The visuals and sound kept people coming, attracting both adults and children; the "moving numbers" window was excellent for showing how the changes evolve; and the "pause" and "step" features let me show people the bells in slow motion. An excellent demonstration facility - many thanks for making it available. I am really enjoying the program; I have not stopped using it since I recieved the code; having great fun, many thanks. Thanks for this, Doug. I have got a laptop dedicated to bellringing and teaching bellringing and your software is excellent for the job. What a difference computer technology makes to many facets of bellringing. 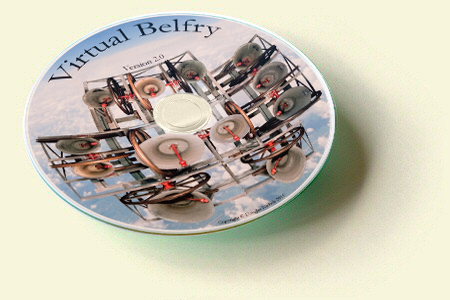 Thanks so much for supplying Virtual Belfry. It arrived this morning and I keep deserting my wife and mother-in-law to work on this fascinating program. It is a marvellous achievement and I look forward to delving deeper into its delights. I think the help is some of the best written user assistance material I have seen for software of any kind - clear, informative and thorough [...] it is fun and easy to use, and has those astonishing images of the bells "in motion". Virtual Belfry is set to carve out new territory in the ringing software world. The program looks very interesting and my wife and I are thrilled to be able to see the bells so clearly. Even our daughter is expressing an interest! It is not really very long ago that I could neither see nor hear [my own bell] but now at least I am able to hear my own bell and I have Virtual Belfry to thank for that.